There is nothing that brings me greater JOY than to see a life TRANSFORMED by being introduced to JESUS. He really IS TRUE HOPE! TRUE PEACE! TRUE LOVE! Mama Frances came to know about Jesus through our Mercy Minister Daniel Coleman. He found her very broken and desperate. She was crying, wanting to leave her life style and the kind of work she was doing. I will let you fill in the blanks. Often in her work, she would be left with no pay and when she went after the money, she was beaten. 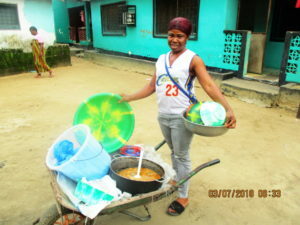 She managed to save enough money, to start a small cooking business. Thank you Daniel for introducing Frances to Jesus, our Redeemer, Savior and Friend! No-one loves like He loves! Daniel Coleman is our Mercy Ministry Director. Ruth is hoping to go to Gr. 1 this year. Favor would be starting Kindergarten. 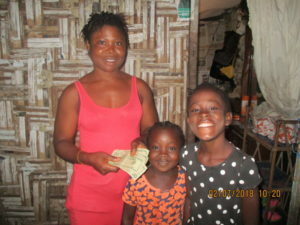 We are believing for the funds to put them to school. 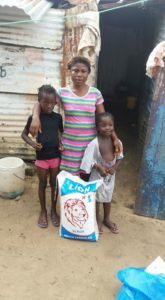 Provision of Hope empowered Frances so she could buy more cooking items, like cassava, plantain, chicken and fish for her soups along with rice. “When i met her I encouraged her that all isn’t lost. She is young and that God has a plan for her. Jesus knows her pains and He bears her fears. If she will only come to Him” Daniel shared. 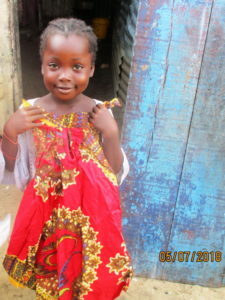 Favor shows her new dress for church! 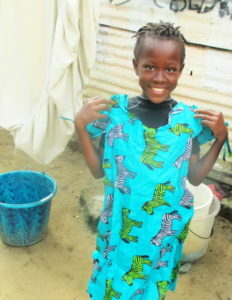 Ruth is so excited for a new dress! First Sunday at the Word of Faith Bible Church with the Leadership Team. Pastor Francis Darlieh is sharing some of the basics of walking with Jesus, and giving Frances some good counsel in her new life style. 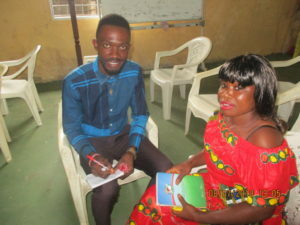 Francis grew up in our Discipleship Training Center and is now attending the African Bible College in Yekepa in Nimba County. He is half way to finishing his degree in Theological Studies. 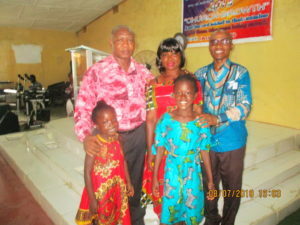 “I am glad that you guys have introduced me to Christ”. It is my hope and prayers never to return to my streets and my old life”. Frances gave her testimony in church and today she is filled with so much peace! Provision of Hope loves to rescue single mothers, for the sake of their children. In this case, if we can help mama make it, we will save her girls from falling into the same lifestyle. Education is a big factor in alleviating poverty. EDUCATION GIVES YOUNG GIRLS A CHOICE! They can BE WHO THEY ARE CREATED TO BE! 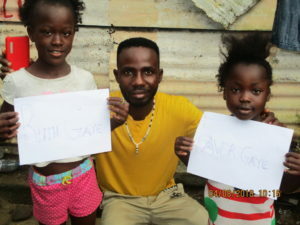 This is why we are hoping to fund these two young girls to school. WE believe Education makes a BIG DIFFERENCE. Can you help us? A full school year is approx. $ 300 USD including the materials needed. Would any one wish to help us with $ 25, $ 50 or $ 100? We would send you a photo of Favor or Ruth in her school uniform. Or, would someone like to buy a new wheelbarrow for Frances? The wheel on this one is bad. Cost is $ 40 for the wheelbarrow and $ 40 for the rain gear. Right now we are busy registering many students to school. Thank you for everyone who sponsors a child to school! You are making a BIG DIFFERENCE! « Lets Celebrate with our Students!! » Can we help Otis Jallah go to school?